Everyday we walk (or run or skip or waddle or bounce) through our day. We all have an agenda – errands, work, traffic, kids, significant others, deadlines… and most of us miss the small things that happen all around us at any given moment. I have been keeping a gratitude journal and part of my journal is to keep track of the small things in life. The bird singing outside, your children’s laughter as they play, getting just last pour of milk out of the carton for your coffee… the point to this is to become fully aware of your surroundings and how these have an effect on your emotions. I encourage all of you to take one minute. Right this very moment. And look around. Maybe close your eyes and just listen. Or close your ears and just see. How many things are you grateful for? I carry around a small journal in my purse so I can write thoughts, memories, information… pretty much anything that comes to my mind that I want to remember. I also take a lot of pictures with me phone. I am a very visual person and I love to capture memories. Those pictures are reminders of that moment, that day, that week, that year… and then more memories start to unfold. And soon you are lost in a perfect day dream of memories. There are a few ways you can participate and keep reminding yourself of all that is around you. 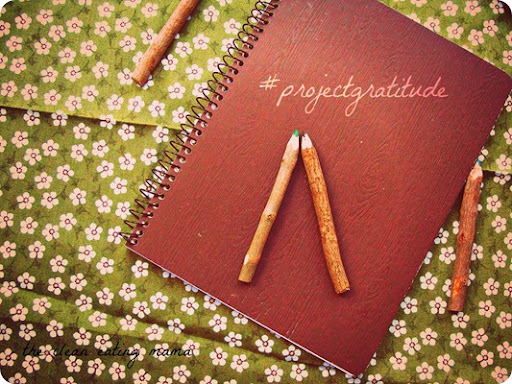 I have created a hashtag for twitter #projectgratitude. 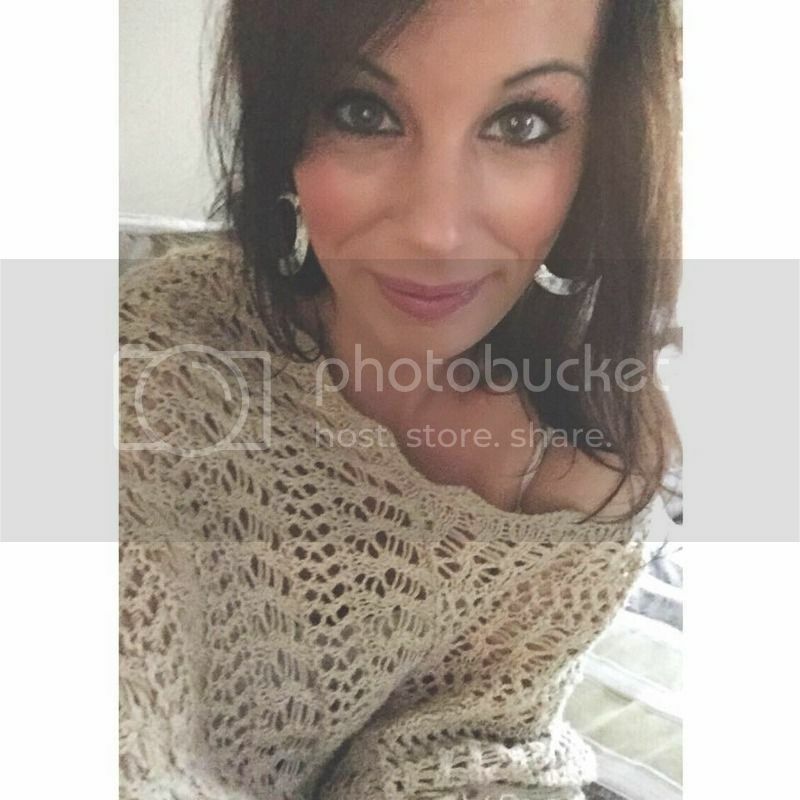 Share your thoughts and pictures with the world! Once you start sharing what you are grateful for, others will join in. I am a huge fan of journals. I write almost everyday. It helps clear my mind and helps me think in a more positive way. I am a pretty private person and sharing my feelings and thoughts with everyone just is not me. So I have several journals where I write about my day, my thoughts, dreams, problems and anything that my mind creates. I started a gratitude journal – I write down at least three things that I am grateful for. They can be a few words or a few pages of description. They are small things like the sound of birds chirping out of my window or large things like my health or individuals that have come in my life. 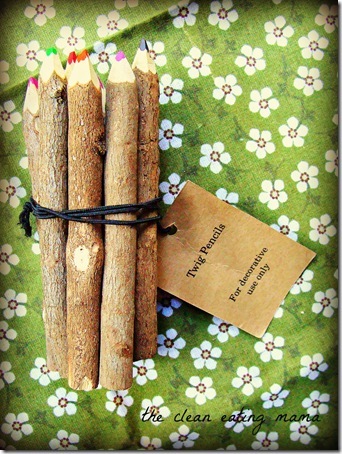 I picked these little twig colored pencils up at World Market the other day – I wanted something special for my journaling. You can also try to meditate or practice yoga. Focus on your breathing and the positives in your life. For some of us this can be hard at the present moment. It takes time to come out of that negative thought process and in to a better one. If you can’t think of anything positive, just breath. Be calm and listen to your heart beat. If you can only do this for a short period of time, that is fine. Remember, it can be hard to get out of a negative mindset. It takes time, practice and patience. 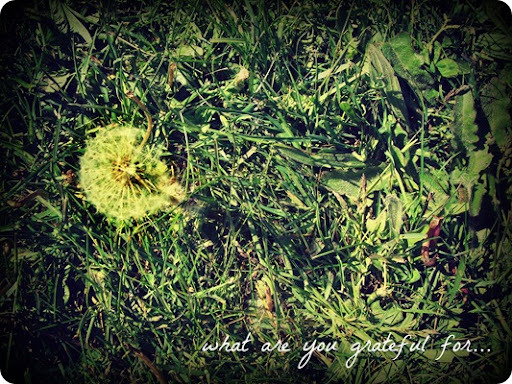 This entry was posted in project gratitude. Bookmark the permalink.